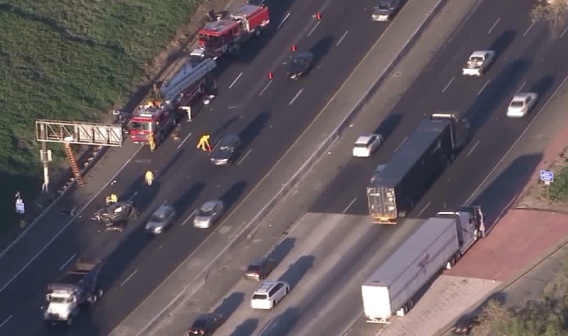 Truck drivers and motorists got a grisly reminder of the importance of seat belts and safe driving during Friday’s early morning commute along the 5 Freeway in Los Angeles. 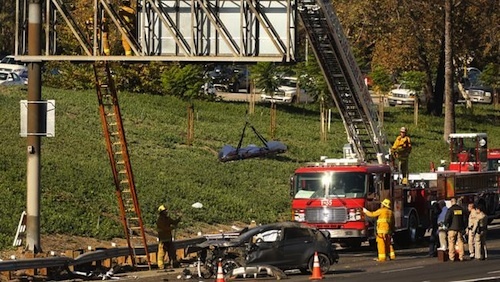 The dead body of a 20-year-old motorist who had been ejected from his vehicle, was suspended on an overhead exit ramp sign for a few hours before emergency workers were finally able to remove the body with a stretcher down a ladder. 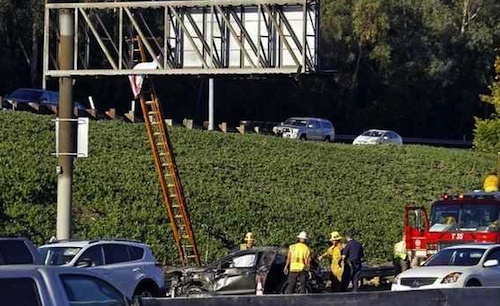 According to the CHP, the rollover crash occurred near Griffith Park just before 7 a.m. when witnesses reported seeing a Ford Fiesta driving recklessly at a high rate of speed and passing vehicles on the right shoulder of the southbound 5 Freeway, just north of the 134 Freeway overpass. A 45-year-old man driving a Ford F-150 told police that he had been in the number 4 lane going about 50 mph when the Ford Fiesta tried passing him on the right-hand shoulder at a high rate of speed and then veered left, hitting the pick-up truck’s rear. The collision caused the Fiesta driver to lose control and his vehicle overturned multiple times before traveling up an embankment. The driver was ejected approximately 20 feet into the air and onto the ledge of the exit ramp sign overhead. After the driver was ejected, the badly damaged Fiesta rolled back onto the freeway and basically stopped horrified drivers in their tracks. Lt. David Smith of the Los Angeles County coroner's office confirmed the deceased driver to be 20-year-old Richard Pananian of Burbank and said that Los Angeles Fire Department paramedics pronounced him dead at the scene. While investigators are still determining Pananian’s exact cause of death, CHP said that in addition to speeding recklessly along the shoulder of the freeway, it appeared he was not wearing a seat belt. "It is disturbing and it just highlights how dangerous driving at high rates of speed could be," added CHP officer Edgar Figueroa. Fortunately, the F-150 driver and his two passengers were not injured. Although emergency responders covered Pananian's body with a sheet as soon as they arrived on the scene, it took them until about 9 a.m. to remove the body safely from the ledge, onto a stretcher and lower down a ladder. A tow truck driver who was called to the scene says that in all his 23 years of dealing with traffic accidents, he has never seen a more gruesome or bizarre aftermath. One less roadrager to deal with. Tricia Stoakes-Pagel was it you that had the friend that won't wear a SB?